1. Make sure that the AR 50 Rifle is unloaded, and engage the safety. 2. Remove the bipod if applicable. 3. 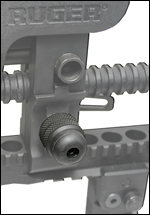 Remove the two forward most receiver bolts from the bottom of the aluminum Forestock while holding onto the rifle. 4. Slide one of the supplied T-nuts all the way down the center channel past the last bolt hole. 5. 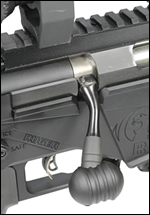 Reinstall both receiver bolts into the aluminum Forestock and tighten to ArmaLite’s specs. 6. Slide the second supplied T-nut into the center channel. 7. 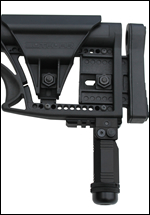 Place the AR 50 Carrying Handle (with the universal mount facing towards the muzzle break) above the T-nuts and align the holes while inserting the supplied bolts and finger tighten. 8. 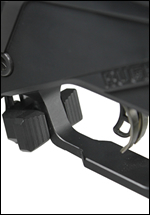 With the t-nuts finger tight move the AR 50 Carrying Handle up and down the channel until the perfect balance point is found. 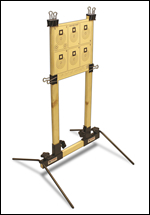 Once you have determined the balance point tighten the bolts. 9. Reinstall bipod if applicable. 10. 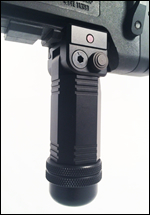 You are now ready to use and enjoy your new CTK Precision AR 50 Carrying Handle with Universal Attachment Mount.